Salem, OR—Oregon employers next year, on average, will pay $1.12 per $100 of payroll for workers’ compensation insurance, down from $1.23 in 2018, under a proposal by the Oregon Department of Consumer and Business Services (DCBS). That figure covers workers’ compensation claims costs, assessments, and insurer profit and expenses. This will mark the sixth year in a row that businesses will experience an average decrease in their workers’ compensation costs. Those costs have steadily declined over the years – even as workers continue to receive strong benefits – because of Oregon’s long-running success in managing the workers’ compensation system. Part of Oregon’s success stems from efforts by the Workers’ Compensation Division. Those efforts include enforcing requirements that employers carry insurance for their workers, keeping medical costs under control, and helping injured workers return to work sooner and earn their pre-injury wages. Another part is Oregon OSHA’s focus on preventing on-the-job injuries by enforcing workplace safety and health rules, and advising employers about how to improve worker safety and health. Employers’ cost for workers’ compensation insurance covers the pure premium and insurer profit and expenses, plus the premium assessment. Employers also pay the Workers’ Benefit Fund assessment, which is a cents-per-hour-worked rate. The pure premium rate – filed by a national rate-setting organization and approved by DCBS – is the base rate insurers use to determine how much employers must pay for medical claims and lost wages. Under DCBS’s proposal for next year, the pure premium would drop by an average 9.7 percent. In fact, the pure premium will have declined by an average of 40 percent during the 2013 to 2019 period. Pure premium is the key factor behind annual cost changes. The decrease is an average, so an individual employer may see a larger or smaller decrease, no change, or even an increase depending on the employer’s own industry, claims experience, and payroll. Also, pure premium does not take into account the varying expenses and profit of insurers. Driving the average decrease in the pure premium are lower medical care costs and less severe claims. 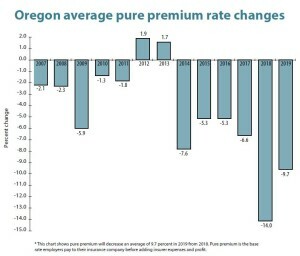 Underpinning the steady decline in pure premium are the successful efforts of the Workers’ Compensation Division, Oregon OSHA, the Workers’ Compensation Board – which resolves disputes over the state’s workers’ compensation and workplace safety laws – and injured worker and small business advocacy services. Those programs are funded by the premium assessment. The premium assessment is a percentage of the workers’ compensation insurance premium employers pay. It is added to the premium. It would increase from 7.4 percent this year to 7.8 percent in 2019. The increase is needed to partially offset the decline in pure premium and to keep pace with a growing economy. This modest increase maintains stable funding for state workers’ compensation regulation and worker protection programs that preserve historically low costs. The Workers’ Benefit Fund assessment provides benefit increases to permanently disabled workers and to families of workers who died from a workplace injury or disease. It also supports Oregon’s efforts to help injured workers return to work sooner – through incentive programs to employers – and earn their pre-injury wages. The fund’s revenue comes from a cents-per-hour-worked assessment. It would decrease from 2.8 cents per hour worked in 2018 to 2.4 cents per hour worked in 2019. The fund is healthy, made so by a growing economy, which allows the rate to be reduced. The decrease in the pure premium is effective Jan. 1, 2019, but employers will see the changes when they renew their policies in 2019. The assessment changes are effective Jan. 1, 2019. Oregon’s workers’ compensation premium rates have ranked low nationally for many years. Oregon had the seventh least expensive rates in 2016, according to a nationally recognized biennial study conducted by DCBS. That was an improvement from Oregon’s ranking as the ninth least expensive state the last time the study was done, in 2014. The Department of Consumer and Business Services is Oregon’s largest business regulatory and consumer protection agency. For more information, visit http://www.dcbs.oregon.gov/.